For high school students in Cape Dorset, the school year came to an abrupt end shortly after it started. 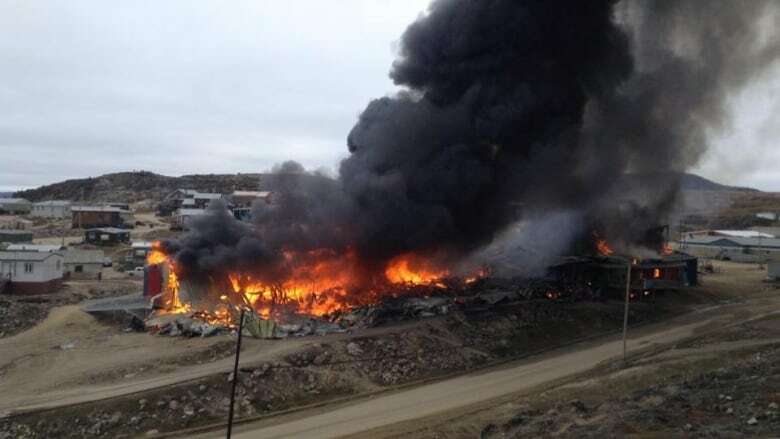 Yesterday, a fire gutted Peter Pitseolak High School in Cape Dorset, Nunavut. Now the northern community is trying to sort out where the students can take their classes. For high school students in Cape Dorset, the school year came to an abrupt end shortly after it started. Yesterday, a fire completely gutted Peter Pitseolak High School in Cape Dorset, Nunavut. Now the northern community is trying to sort out where the students can take their classes. Fred Schell is the former MLA for the community, and his daughter recently started attending the school. As he tells As it Happens host Carol Off, parents have no idea where the students will now take their classes. "There's nothing. I mean it's right to the ground. The entire high school is burnt. The only thing that's left on the ground is scrap metal from the siding," says Schell. Schell says he's heard rumours that police have made some arrests related to sniffing gasoline at the school, but he says, so far, they are only rumours. Cape Dorset is a small community of 1,400 people. Approximately 153 students attend Peter Pitseolak High School, which has classes from grades 7-12. The closest school is an elementary school three blocks away, "but it's full already," says Schell. For Schell's daughter, this is her first year in high school. "She's very upset. And of course, my daughter, she really looked forward to going to school. I mean, she doesn't miss very much time at school." Schell says it will be difficult to rebuild the school because it would have to be redesigned. Plus, because it's so late in the year, the only way to get supplies delivered is by sealift. He predicts it will be two years before the school can be rebuilt. Also lost in the fire were some valuable paintings. "They dedicated the one room there to Kenojuak Ashevak, who was a very famous artist here. And some of her very famous prints would be inside there, so yeah, there was some valuable stuff that can't be replaced." Schell says officials are still working out where and when students can attend classes.